B+ - The publicity for Matteo Garrone's Italian crime behemoth, Gomorra, lauds the film as a willful de-glamorization—a "grittification," if you will—of gangster mythology, cinematic and otherwise. Yet even this claim doesn't quite convey the peculiar, bracing subversiveness of the film. What Garrone delivers is not another Mafia Movie, but a finely crafted movie about the Mafia (or, to be precise, Naples' crime syndicate, known as the Camorra). Gomorra is a fearful, agonized panorama of a criminal organization's place in an apartment complex, a neighborhood, a city, a nation, a world, a universe. It is a vast, fragmented, and repulsive film. You can taste the dust on it, smell the garbage, feel the flies brushing past your eyelashes. Many crime dramas have countered the romanticism of The Godfather by cranking up the brutal violence and moral degeneracy. Gomorra takes a more daring approach, tossing out the entire epic form, cribbing loosely from the hyperlink cinema style of Altman and Iñárritu, and binding its storylines together with the frayed twine of locality and human weakness. It's mesmerizing, in its way, even if Garrone never molds it into a graceful shape. Of course, given the film's approach to its subject matter, I'm not sure it would be wise or even possible to do so. 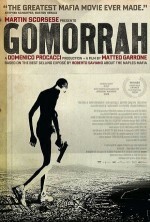 Gomorra is a film deformed by dread, full of discomfiting vibrations that rattle the viewer deep in the belly. Garrone takes a discriminating, studious line of attack in presenting the film's multiple threads. He selects five stories connected to the Camorra and observes each tale's rot with an eerie calm and sickening clarity. These stories are only loosely stitched to each other, if at all, and the decision to forgo the typical preoccupation with synchronicity serves the film well. The connective tissue here is much less contrived, as it is comprised of setting, tone, and theme. Gomorra's thesis is hardly provocative: organized crime is an awful institution that gobbles up and spits out everything it encounters, lacking any other mode for interacting with the world. It's not the most original sentiment, but Garrone presents it without the now-tired operatic grandiosity or relentless homage. (Well, not much, at any rate. A character does cite Scarface and the film visually quotes The Godfather wedding scene, but these are completely apropos and tremendously sly, respectively.) Indeed, although Gomorra is a fictional work inspired by real events, it strikes the look and feel of a low-budget nature documentary, what with its handheld camera work and mood of wary observation. It invites a wondering queasiness that these events are happening in the world, in one form or another: this treachery, this corruption, this abandonment, this ultimatum, this folly. The stories all have a familiar odor, but Garrone presents each with a vigilance for both character and place. Tito (Nicolo Manta) is a young adolescent who ingratiates himself to the neighborhood gang, a move that eventually requires him to betray friends and cover himself in innocent blood. The money-carrier Don Ciro (Gianfelice Imparato), who doles out payments to old gangsters, widows, and families of jailed members, finds himself caught in the middle of a clan feud. The master tailor Pasquale (Salvatore Cantalupo) angers his company's mob backers when he tries to moonlight at a Chinese factory. Roberto (Carmine Paternoster), a deputy for Camorra waste management kingpin Franco (Toni Servillo), begins to doubt his chosen path when he witnesses the environmental and safety disasters he helps create. Finally, hopelessly dim wannabe tough-guys Marco (Marco Macor) and Ciro (Ciro Petrone) go on an inept crime spree that draws the lethal ire of the local Camorra boss. The performances are commendably genuine, especially that of Cantalupo, who expertly conveys Pasquale's gentle, modest demeanor while also revealing the bitterness in his heart. Paternoster also deserves praise for lending heft to a role with sparing dialog, as almost everything we need to know about Roberto is conveyed through the way he watches his boss. Garrone's Naples has the look of a former Soviet metropolis, festering with corruption, crime, and neglect. No, scratch that: It evokes some kind of urban dystopia just beyond the horizon. Much of the action takes place in locales oozing with a profound despair: crumbling housing projects strewn with garbage; abandoned quarries full of toxic sludge; sweltering textile factories; shabby arcades and strip clubs. This environment, established with such striking fidelity and ruthlessness, veritably bellows the film's disgusted subtext. The Camorra's violence and depravity contribute to a grueling negative feedback loop: the organization is fighting over scraps at the end of history, even as its actions hasten that end. Or, to put it another way, the mob shits where it eats—carelessly, even gleefully, so. Much of Gomorra's thematic meat is the stuff of countless films about organized crime: loyalty, machismo, peril, deceit, enterprise, and so on. Garrone's treatment of these element isn't really extraordinary or even particularly novel. The five primary storylines—and a few tangents—are fairly simplistic stuff. Characters make foolish decisions, suffer consequences, and then either rectify their mistakes or blindly proceed down the same path. Individually, none of the stories is tremendously enthralling, although all are told with a reserved style that turns the head, if only because observing a drive-by shooting the way one might observe a lion attack on a wildebeest herd seems so incongruous with the strained "humanity" we expect of a Mafia Movie. What makes Gomorra compelling is Garrone's skill for dribbling in unsettling moments and details which either reflect an artistic sensibility more sophisticated than the film's rough edges might suggest, or which simply contribute to an overwhelming aura of doom and madness. In the former category, consider an offhand remark from Tito's friend about his infected lip piercing, obtained as a gang initiation, or the way that Ciro's raspy tenor evokes the ailment of the film's aging don, who can only be understood when he clasps his hand to his throat. Examples of the latter include the blackened, bombed-out apartment (never explained) that Don Ciro passes on the way to a delivery. Or the chilling yowl that the emaciated Marco unleashes, seemingly to himself, as he stands in a polluted river wearing only a Speedo and assault rifle. These elements knit together to convey a sense of both claustrophobia and vulnerability, the smell of a civilization cornered, exposed, teetering, dysfunctional beyond all hope of salvation. That Garrone establishes this nightmarish tone so decisively from a neat stack of five sad little urban dramas is not just impressive, it's downright spooky.